One thing that I have always struggled with when wearing glasses is my makeup, I could never get my head around how to wear it. As I now wear contacts most of the time, this problem doesn’t really bother me, but it used to. Until I turned 16, I wore glasses every single day. The other day, when I was having a glasses day, I started thinking about the best options for pairing makeup and glasses, surely there had to be a way? I realised that although there is an art to it, us glasses gals can make things easier for ourselves when it comes to makeup. 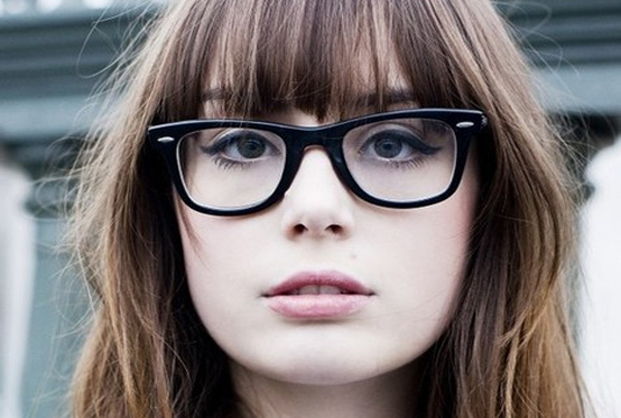 The mistake that many of us glasses gals make is attempting to overcompensate for our glasses by wearing more makeup. Your glasses frames take up a lot of your face, so you don’t want to wear too much eye makeup, as it could clash with with them. While you can add a bit of colour to your eyes with eyeshaddow or eyeliner, it’s best to keep things as neutral as possible. Your glasses frames will be the first things that people see when they look at your face, that’s why it’s important that you use your makeup to compliment them. If you don’t take your frames into account when doing your makeup, you will end up with a face that clashes – this is never a good look. If you have brightly coloured glasses frames, you will need to ensure that you only use neutral makeup. If your frames are more ‘invisible’, then you have more freedom to be bolder and brighter with your makeup choices. As any glasses wearing gal knows, there is nothing worse than getting mascara smudges on your glasses every time that you blink. Instead of using lengthening mascara – there is no point adding length when you lashed only brush your lenses, add volume. Top tip: If possible, always opt for waterproof or smudge proof mascara, as these tend to dry more quickly. Once they have dried, no matter whether the heavens open or a bucket of water is chucked over you, your mascara won’t run onto your lenses. This might sound a little strange, but you should be tailoring your makeup to your lenses. Did you know that if you use long-sighted lenses your eyes will look larger, while short-sighted lenses will make your eyes look smaller? If you are long-sighted, make sure to keep your eye makeup as neutral as possible, as your eyes will already stand out. If your are short-sighted, use bolder colours and shades to help make your eyes stand out. It’s easy to presume that getting your glasses and makeup pairing right is impossible, but it doesn’t have to be. As long as you follow the tips above, you can make it much easier for yourself to get your makeup spot on.